Koorland, the last son of Dorn, finally confronts the Beast in battle. The first attempt to attack the orks' home world has failed, but the Imperium is not defeated yet. New, more flexible fighting teams of Adeptus Astartes have been assembled - the Death Watch. Allies from the Imperium's past have also pledged their support, the legendary Sisters of Silence, female warriors with anti-psyker powers. With new troops, and revised tactics, Koorland leads a second attack against the orks' home world. This time, the attack goes better, and Koorland is able to confront the Beast in battle. But the creature is truly a monster, more than a match for even a primarch. 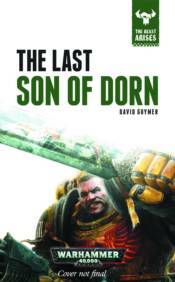 How can the last son of Dorn possibly prevail?